The England Knights will tour Papua New Guinea later in the year for two matches against the Kumuls. The England Knights consists of players on the fringes ready to make it into the England side. It has been more than two decades since the Knights had a ‘series’ in PNG. 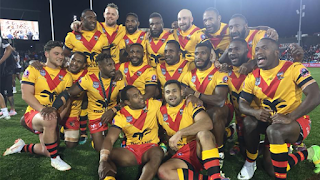 The first of the two game series against the Kumuls will be played on October 27 in Lae. The second a week later in Port Moresby on November 3, 2018. An agreement was signed with the English Rugby League Board and was endorsed by the RLIF. Chairman Sandis Tsaka said. “Crowds will be in attendance at both venues to watch these two teams play knowing that they will have seen the future England side first hand,” Tsaka said. Meanwhile, an emerging Kumuls Under 23 squad will take on the New South Wales Under 23 in Port Moresby on October 13. The emerging Kumuls U23 team will be selected from Digicel Cup and Confederations. The curtain raiser to this game will be between a Australian Defence Force women team and a select Confederate women’s side.